Can you say "OLE"?!!! This Mexican inspired veggie quiche goes great with a side of fresh salsa and sour cream. 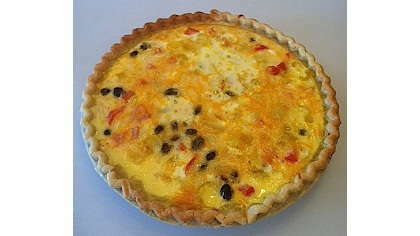 Layer pie shell with onion, tomato, blacked beans, peppers, and cheese. In a small bowl, whip eggs, milk, salt and pepper. Carefully pour egg mixture over toppings. Place quiche on a baking sheet and bake for 30 minutes at 350 degrees.